In general, you will earn pension funds also when you work abroad. Before you go abroad, find out how you should arrange your pension provision in the country in which you will work. Have you been posted abroad by a Finnish employer or are you working for a foreign employer? Are you working in an EU/EEA country, Switzerland, a country with which Finland has signed a bilateral social security agreement, or a non-agreement country? Is there a statutory pension system in the country in which you will work? As a rule – whether you are an employee or a self-employed person – you will be covered by the social security laws of the country in which you live. You or your employer will pay your social security contributions to that country, and you will receive social security benefits (such as a pension) according to the laws of that country. This main rule applies regardless of your nationality or the domicile of your employer. If you are posted to an EU/EEA country, Switzerland or a country with which Finland has signed a bilateral social security agreement, you will earn pension funds to Finland while you work abroad. When you go abroad, you need an A1 certificate for a posted employee with you. The certificate has to be applied from the Finnish Centre for Pensions. 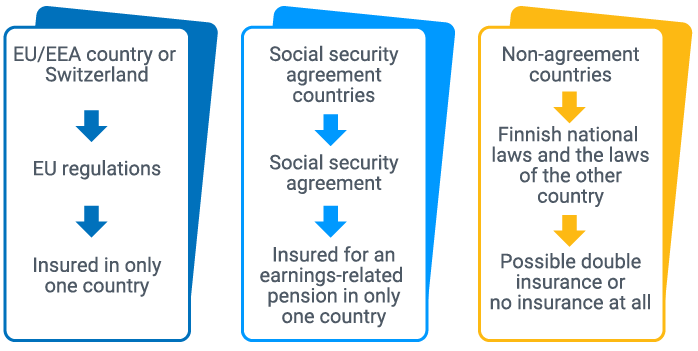 If you are posted to a non-agreement country, that is, a country with which Finland does not have a social security agreement, your pension funds will grow in Finland. Note that you may have to pay pension insurance contributions also to the country in which you work. As a rule, when you work for a foreign employer abroad, you will earn pension funds to the pension system of that country. Your pension will also be calculated under the foreign pension rules. If you work in an EU/EEA country, Switzerland, or a country with which Finland has signed a social security agreement, the pension you have earned abroad will be paid to Finland in due course. Some non-agreement countries do not pay pensions abroad at all or only with certain restrictions. All countries do not have a statutory pension scheme. As a rule, if you work for a foreign employer in such countries, you will not earn pension funds for that work. Taking out pension insurance in the country in which you work means that your overall social security will be determined based on the laws of that country. For example, if you are insured in another EU/EEA country or Switzerland, you cannot receive residence-based benefits from Finland (for example, the maternity allowance or the child benefit), even if you are considered to still live in Finland and work abroad only temporarily.